Each store has been selected by Mohawk to represent its best and most complete product lines. 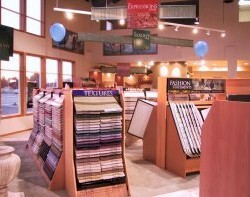 Introduced in 1999, Mohawk Floorscapes dealers offer a unique, comfortable shopping environment by salespeople trained by Mohawk's premier training academy, Mohawk University™. In addition, these retailers can take advantage of Mohawk technical training, partnership programs with other flooring manufacturers and special warranties. Mohawk Industries established developed the Floorscapes® concept to help floor covering retailers create an easy-to-shop environment for the consumer and to educate the retail sales staff. A Mohawk Floorscapes dealer is the pinnacle of the Mohawk dealers. This independent retailer offers the most complete selection of Mohawk products covering all lifestyles, colors, and price points. Customers desiring the best in product selection, quality and value are able to fill all their flooring needs in one place.